The UK PlayStation Store is turning 10 and, like the friend that always throws a great party without the expectation of an expensive gift in return, to celebrate it’s doling out discounts on many top games. 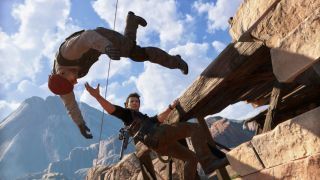 It’s not all first-party titles (it’s a 10th birthday, not a 21st) but there are plenty of good discounts to be had on must-haves like Uncharted 4 and The Last of Us. Things are even better for PlayStation Plus members, as they get even deeper discounts. So, if you’ve not picked up the latest smash-hit adventure starring Nathan Drake, you can get Uncharted 4 for just £19.99 (or £15.49 if you’re a PS Plus member). Don’t much care for adventure but love a good scare? Until Dawn is going for only £15.99 (or £12.99 for PS Plus members). It’s not just PS4 titles, either – if you still have your PS3, PSP or PS Vita to hand you can get great discounts on titles like Crash Bandicoot ahead of its upcoming remaster for just £1.99. You can find the full list of discounts, which is 12 pages long, by visiting the PlayStation Store.